Many people skip their outdoors cleaning until it is too late and their outdoor landscape has been neglected for years and it is highly evident. If your house exterior needs to be cleaned but you do not have the proper equipment feel free to give our company a call and book our professional jet washing service, it is available everywhere in Hammersmith. 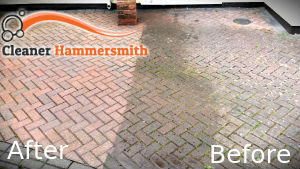 Our company is offering you economical prices and an outstanding jet washing service. When your driveway or patio is looking dull and it has moss growing on it, be sure to call our company and book our professional jet washing service to take care of this problem. Choose our jet washing service and have your entire home exterior perfectly cleaned. We can clean stone walls or fences, patio, decking, driveway, etc. Whatever the problem might be – moss, weeds, discolouration, accumulation of dust and grime, our professional pressure washing machines will help our cleaners get rid of any problem. 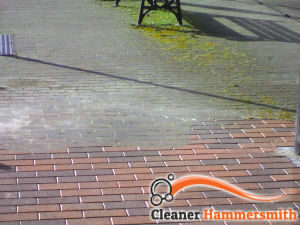 Our cleaners are experts in this area and have helped thousands of people from Hammersmith, W6 with their jet washing needs. And our service is available for residential and commercial clients. You can hire our service for any convenient time for you, our cleaners work seven days a week and have flexible work hours. Our company guarantees you perfect results. What is more, our cleaners are trained and are very diligent while cleaning and we can guarantee you that there will be no damage done to your garden or your property. Enjoy having your house exterior cleaned by true experts and enjoy our practical prices.